That's what I love about reading: one tiny thing will interest you in a book, and that tiny thing will lead you onto another book, and another bit will lead you onto a third book. It's geometrically progressive--all with no end in sight, and for no other reason than sheer enjoyment. Okay, so I'm extending my e-show. It closes at the end of the month, but if sales continue to be slow, I'll extend it again. Check it out! Cay Gibson, a guru of picture books, is putting together an Author Fiesta. She even has a cool cover you can print out for each child's binder. Take a look. Thanks, Cay! 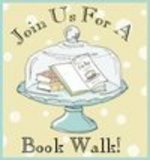 Cay is having a Cake Book Walk! Come over and join in. The book? Why the eagerly anticipated Christmas Mosaic. I've already ordered mine, but who wouldn't want one autographed by the lovely Cay. Click on over before the day's out. Melissa Wiley has more about her decision to not write any more of the Charlotte and Martha books. I can only imagine her heartbreak each time she thinks of these two characters. She makes a good point about speaking with our wallets. If we enjoy a good book, we must make a statement to the publisher. The only way to do that is to buy the book. It's not like TV where a letter writing campaign (a la Law and Order) can bring a show back. As for me, I can't wait to see what new adventure comes from the Bonny Glen. Melissa Wiley, author of such wonderful Little House books like Across the Puddingstone Dam , On Tide Mill Lane and other Martha and Charlotte stories, will no longer be writing them. We fans are so disappointed. I've read the first three Charlotte books (I don't know what I was thinking to read the Charlotte ones before the Martha ones--I usually never read out of order.) to the children and they love them. We've taken it slowly and will start reading them again. It saddens me to hear that the publishers are offering the abridged editions. The books are going fast so if you want to have the unabridged editions buy them now. I had planned to write about our homeschool group's field trip. We took a river cruise and spotted two eagles. However, I have a book study tomorrow with the moms of the group. We are studying I Believe in Love by Father Jean C. J. d'Elbee. We're only studying the first chapter this month, but I still haven't read it. So, the details of our eagle sighting will have to wait until tomorrow. I got it!!! I was so happy to see it in my mailbox. It was wrapped oh, so carefully. I had been worried too. We are going out of town and the postal carrier and the UPS man tend to leave packages on my front porch. When it rains, the whole porch gets wet. If there's a package, then so does the package. I've had book deliveries ruined because of this. But, I needn't have worried. If it had happened with this delivery, the book would have been safe--Catholic Mosaic was wrapped in plastic. Thank you, Hillside for that and the book. I haven't had a chance to really browse the book, but what I have read is wonderful. What a resource, Cay. Congratulations. And, thank you for the answers. I am a literature challenged person--English classes in high school were my worst ones although I always made an A. Anyway, if there's anyone who doesn't even know about this book. You should order it. Check it out. One of the ladies from the Real Learning messageboard has put together a wonderful book that called Catholic Mosaic, Living the Liturgical Year with Children. You can preorder the book and receive free shipping before May 17th. I can't wait to receive my copy.